I just recently found out that Dominican Sisters of Mary, Mother of the Eucharist are competing in this round (season?) of The American Bible Challenge on Game Show Network. I didn’t know there was such a show on TV! Even moreso, it’s hosted by Jeff Foxworthy! 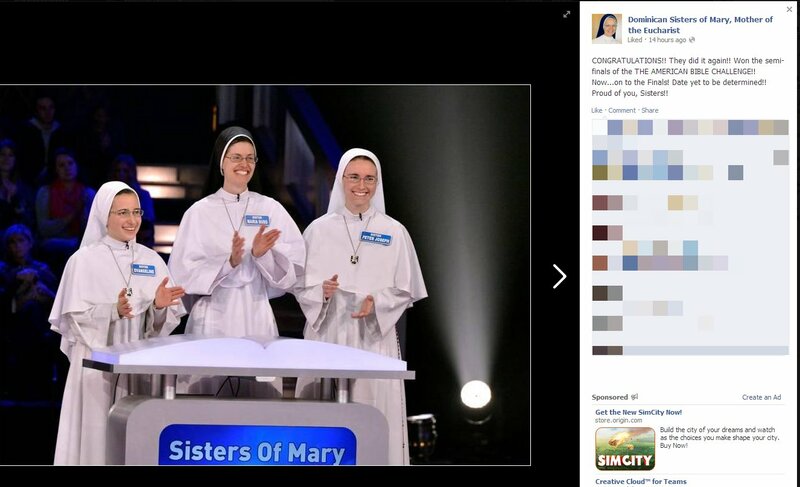 Haha, I think this is really cool because sometimes we Catholics are stereotypically not well versed in book-chapter-verse Biblical knowledge and here we have nuns on a game show that tests Biblical knowledge with occasional quasi-Minute To Win It challenges. …and so far, they’re doing pretty well! I wish I had known about this sooner…and I wish I had caught the semi-finals episode…but alas, this past Thursday I was in the middle of a meeting with a Knight of Columbus regarding insurance.